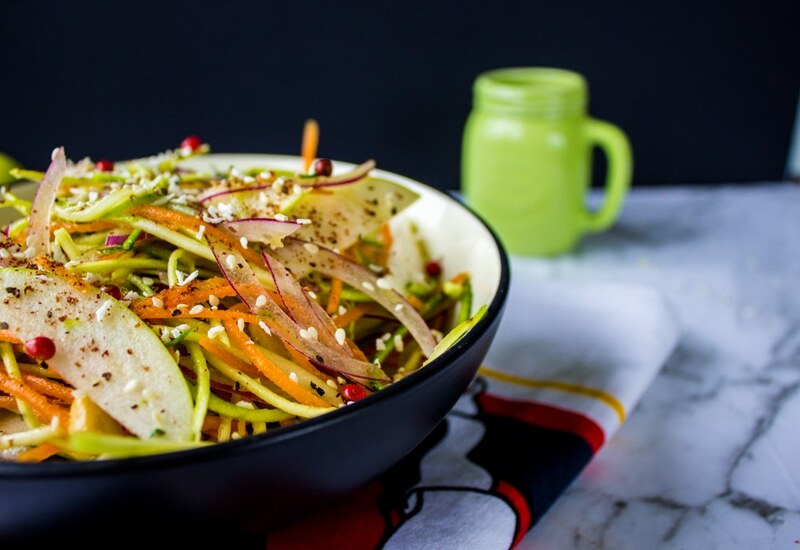 This Asian inspired citrus salad recipe puts your spiralizer slicer to good use with raw zucchini, cucumber, and carrots. The coconut flakes, peanuts, lime and sumac gives it a punch of exotic flavors while the brightness of the colors in the ingredients makes it one pretty salad to indulge in without the guilt! For a vegan version, use agave syrup instead of honey and omit the fish sauce. Per Serving: 431 calories; 24g fat; 49.4g carbohydrates; 13g protein; 0mg cholesterol; 810mg sodium. Note: I left out red onion, as I do not like it. I also did not have sumac on hand, so that was also not in it. I also finished with a little sesame oil after tasting it. I love Asian-style cucumber salads, especially with fish sauce, for some reason. This felt more like a main dish than the sides I'm used to eating, thanks to the volume of zucchini and carrot in it. Great stuff. The flavors just weren't quite strong enough for me. I'd double the fish sauce and ditch the soy. She sesame oil really gave it a lift. You could serve this with satays or some other grilled chicken, but this makes a great picnic salad. Highly recommend, but be ready and willing to tinker to suit your palate. My spiralizer is in heaven and so am I! The fresh veggies plus a tart apple and a little coconut really come together nicely with the soy-sumac-lime dressing. So citrus-y and fresh! This zucchini and cucumber salad was really good! I loved the lime juice with the honey and soy sauce dressing. i left out the coconut and apple, and instead added thinly sliced radishes to the salad. I just love the way radishes taste in Asian salads. I will definitely make this salad again as a side to maybe sushi or chicken. I did spiralized sweet potatoes instead of carrots to make this salad. It was really good! I also omitted the fish sauce. My favorite aspect of this dish was definitely the sliced apple (I used Granny Smith). I also spiraled the apple to make this delicious salad. It was very fresh, love the crunch and texture of all the ingredients. It works extremely well together. Used Worcester instead of fish sauce.